Modern society wouldn’t exist without the chemical reactions that produce fuels, raw materials for plastics, and pharmaceutical agents. Critical to these chemical reactions are catalysts, which are chemical species that speed up the rates of reaction without being consumed. 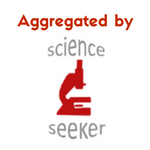 In 2005, over $900 billion in chemical products were synthesized via catalytic reactions. The discovery of catalysts is often a critical bottleneck in the development of emerging technologies. One such technology is the water electrolyzer, which uses electricity to split water into hydrogen and oxygen gases. Hydrogen gas is an environmentally friendly, clean burning fuel used in fuel cell-powered vehicles. Hydrogen gas is produced via the reduction of protons at the cathode, while oxygen gas is produced via the oxidation of water at the anode of an electrochemical cell. These are the hydrogen evolution reaction (HER) and the oxygen evolution reaction (OER). For water electrolyzers to become industrially-viable devices, catalysts for the HER and OER need to be composed of elements abundant in the Earth’s crust, efficient and stable in water. A promising catalyst for the oxygen evolution reaction is class of materials based on nickel-iron oxides (NiFeOx). NiFeOx-based catalyst systems are efficient at oxidizing water and are composed of elements that are highly abundant. Unfortunately, this catalyst degrades after prolonged use. Therefore, a key scientific goal is the development of methods for the stabilization of NiFeOx water oxidation catalysts. 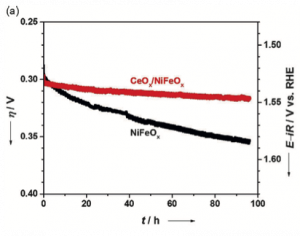 In this study, the researchers found that coating a NiFeOx catalyst with a layer of cerium oxide (CeOx) protected the NiFeOx from degradation while maintaining high efficiency towards the oxygen evolution reaction. The researchers synthesized the CeOx-coated NiFeOx catalyst via electrodeposition and confirmed the synthesis via x-ray photoelectron spectroscopy, Raman spectroscopy, x-ray diffraction, and various microscopic techniques. Scanning electron microscopy images indicated that a ~100 nm NiFeOx film was coated by an approximately 300 nm thick CeOx layer (Figure 1). Figure 1. 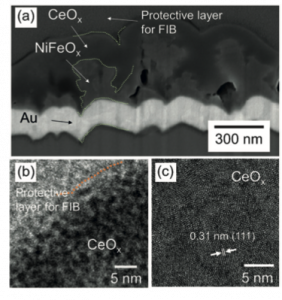 (a) Cross-sectional scanning electron microscopy images and (b,c) high-resolution transmission electron microscopy images of the CeOx-coated NiFeOx OER catalyst. The stability towards water oxidation of the CeOx-coated NiFeOx catalyst relative to that of the bare catalyst was then determined via an electrochemical technique called chronopotentiometry (Figure 2). In this method, a constant current density is applied and the applied voltage required to produce that current density is observed as a function of time. Increases in applied voltages are indicative of a catalyst undergoing degradation. Here, the scientists found that the voltage required by the uncoated NiFeOx catalyst to produce 20 mA/cm2 increased by 60 mV over 96 h. In this same time period, the voltage did not change in the CeOx-coated NiFeOx catalyst while maintaining the same current density. This stabilizing effect of the CeOx coating was confirmed by further electrochemical degradation testing. Figure 2. Chronopotentiometric testing of the NiFeOx and CeOx-coated NiFeOx catalysts, demonstrating the improved stability of the coated catalyst. The researchers were fascinated by the CeOx layer- how does it allow for OER products (O2) and reactants (OH–) diffusion while preventing degradation products from diffusing out? Further testing of the efficiency of oxygen evolution in the presence of reducing agents with varied molecular radii and electrostatic charges helped tease this out (Figure 3). Through these experiments, it was determined that the diffusion of larger anions was suppressed compared to the diffusion of smaller anions. Furthermore, neutral species diffused through the CeOx layer more easily than anionic species, likely due to the negatively charged nature of the CeOx coating. Figure 3. The CeOx layer allowed for the diffusion of OER products and reactants (O2 and OH–, respectively) and prevented the diffusion of NiFeOx degradation products. This development of a permselective coating that protects oxygen evolution reaction catalysts from degradation is a notable advancement in this field. 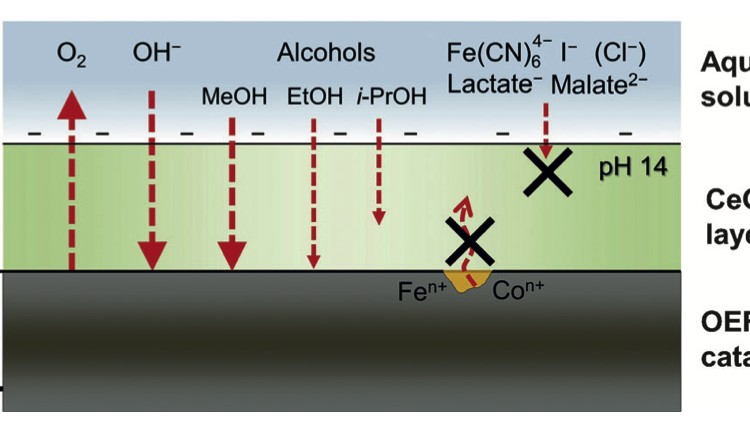 While NiFeOx is widely regarded as a highly active, earth-abundant water oxidation catalyst, its degradation has been the subject of much scientific concern. This study demonstrates progress towards the development of a stable OER catalyst capable of operating over long time periods. As this work continues to move forward, the production of clean-burning hydrogen fuel from water may become industrially viable.